What if you really can have it all? No–really? What if everything you THINK you desire is only a starting point for the life you are truly capable of creating? On Love, Life, & All Things Weird, we playfully explore topics from money to magic, healing to wholeness, creation, relationship, business and more. There’s no place we won’t go, nothing too wacky or weird in the quest to live as grand a life as possible. Hosts Megan Sillito and Suzanne Stauffer are the embodiment of “opposites attract” and the result is true synergistic power. Partnered in love and in business, they’re taking co-creation to a whole new level. 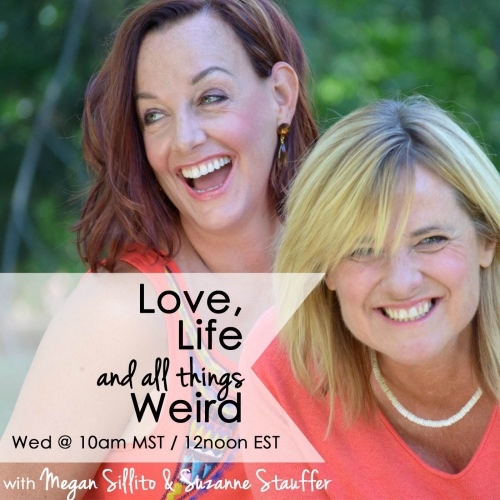 Join Megan and Suzanne for Love, Life, & All Things Weird, where we will talk about living a life that’s inspired, overflowing, and completely awesome. Megan is an adventurer, explorer, surfer, and life coach. Her uncanny capacity to dream big and her playful approach couple masterfully to support the creatives of the world. Megan helps hack through the overgrown “can’ts” and paves a path for individuals to embody their genius capacities, launch epic projects, and transform their lives and businesses. She has been coaching and facilitating individuals and groups for over 20 years. Suzanne is a guide, truth teller, and soul revealer. She can empower you to dust off your soul’s truth, and unveil the most authentic, magical, and abundant YOU you’ve ever imagined. 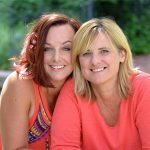 Suzanne’s 20+ years of diverse experience–paired with her training as a psychic, personal trainer, health coach, and accountant–uniquely qualifies her to bring new clarity and a revitalizing energy to every area of your life. Together, they’re the embodiment of “opposites attract”, and the result is true synergistic power. Collectively, they’re the summation of Megan’s big vision coupled with Suzanne’s knack for the details, Megan’s universal wisdom punctuated with an exclamation point by Suzanne’s incisive truth, and Megan’s playful meanderings subtly sorted by Suzanne’s practical step-by-step approach. Partnered in love and in business for the last five years, they’re taking co-creation to a whole new level. You Opened Your Dreamer, Now What? Universe, What Adventures Are You Creating for Me? Is it Time to Lose Control and Be Chaos? Are You Using your Emotions Against You? Dude, I Lost My Magic! Is it Time to Fire Your Guru? Are you Creating your Body & Biz from Judgment or Joy? Your Body & Biz are Talking: Are you Listening? Do You Sabotage Your Change? That’s Just the Way it Is!!! Consistency is the Key – NOT! Truth, Did You Take a Vow of Poverty? Is Money Your Lover or Your Ex? Is Having it All really possible?